Hey fellas, I ordered 50 10mm supa' brite leds from Hong Kong to do the bawls lamp with, and upon getting them I started messing around the house with them and wiring them with resistors, and wiring them in series using different voltages to see what happens. I have been thoroughly enjoying myself. I recently (while waiting 2 weeks for the leds) hacked a little pocket sized laser to take 3 AA batteries, it seems really brrite, but more importatly got me doing something! Well if anybody wants to they can check out my rather boring blog, and click on the photo link at the top to see images of these on flickr. Any more info on this project? Looks quite good. thanx for the compliment. I used a coupla different ideas, but most of the engineering came from your site. It's 4 of those 10mm leds glued to a piece of PVC (cut longways in half) with resistors (~517 kohm maybe?) on a 12 volt DC adaptor. I need to take it off to put a switch on it, when I do I will take pics and put them up (be warned, it is UGLY!) I'm trying to make stuff and learn as I go so that eventually I can dream up a little more complex circuits. I am gathering parts for a coupla solar BEAM bots, and I can wire these up all day long, but I don't understand what all the codes on the transistors mean. Caps, I understand, resistor color codes I know how to look up, but transistors don't seem to have any rhyme or reason as to what they do. I'm looking at different projects (either in make, or online) and they call for a certain transistor so I go looking (either at the local shops, or through the parts that I've de-soldered from old junk around the house) and as far as I can tell I'm gonna have to order some stuff from the net. The other project is a Bawls lamp for my son and I to do together. 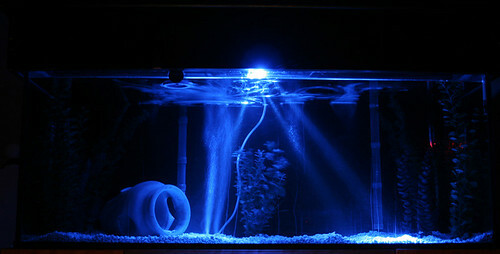 I have decided to revamp the aquarium lights for a little more evenly distributed lighting (I've ground them down flat, and roughed up the sides some) I will probably attach them to the hood of the aquarium and put a photocell on it to automatically come on when it gets dark. The resistors in the above quote are 520ohm, not kohm! As I put this one together I'll take some pics to put up on MAKE pool on FLickR. The transistors still have my head spinning though! Any cool sites for the layman type to understand these things more? Sounds great, Make had this transistor information on their site a while back. I have added it to the electronic resources section. Have a look and see if it helps.